When it comes to packing for a trip, I like to have all the essentials in my carry on purse. Valuables, items I need in flight, items I know I can't "pick up" if my checked bag was lost, and items I want the second we land. I've never been able to find a stylish/lightweight bag that could keep me organized, zips up entirely to keep my items secure, and straps to my suitcase to keep me hands free (and shoulders free) while getting through an airport...until I found the OG bag by Lo & Sons! It's an avid organizers dream! 1. Water Bottle with a built in filter - water is one of my absolute most needed items when traveling- but, I don't want to spend $ on a water bottle once I pass through the security line. 2. Snack & Gum- The worst thing is being starved- rushing to catch a flight, only to find an expensive non nutritious meal once I get on the flight. Carrying raw almonds is my way to get ahead of this. 3. Clothes- a wrap/scarf, one item (like a dress-navy & white maxi pictured above) I could wear if my checked bag was lost, extra pair of shoes and my sunglasses. 4. 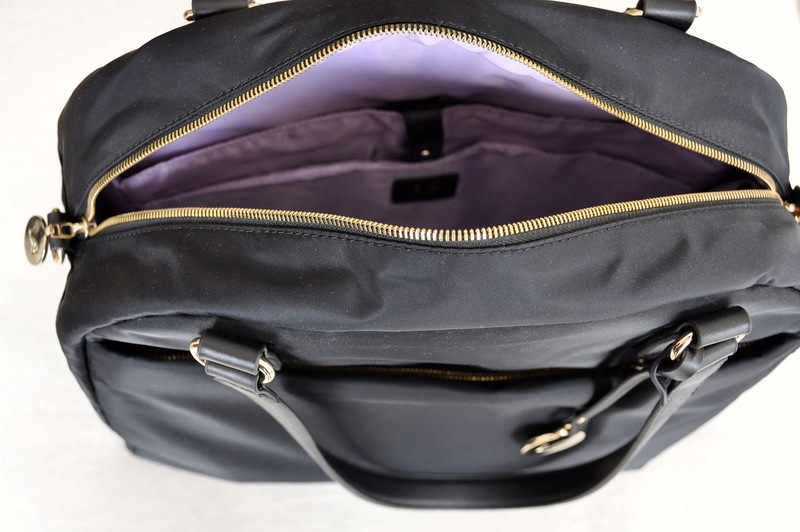 Beauty essentials- I keep my makeup bag, lip balm, eye drops, evian spray, and non-scented lotion, vitamins/supplements with me in flight (never would want to buy new makeup when I land if they lost my luggage). 6. Chargers & Headphones! Hate having no headphones OR having a dead phone. I wrap my chargers up and place them in a sunglasses case. 7. Reading materials- magazines, books, kindle- whatever it is you like. Sometimes I also bring a small journal with me if it's a trip I want to write/sketch on. Lo & Sons is offering 15% OFF all products on their site in honor of Mother's Day- just use the code "MOMSRULE2013 at checkout. 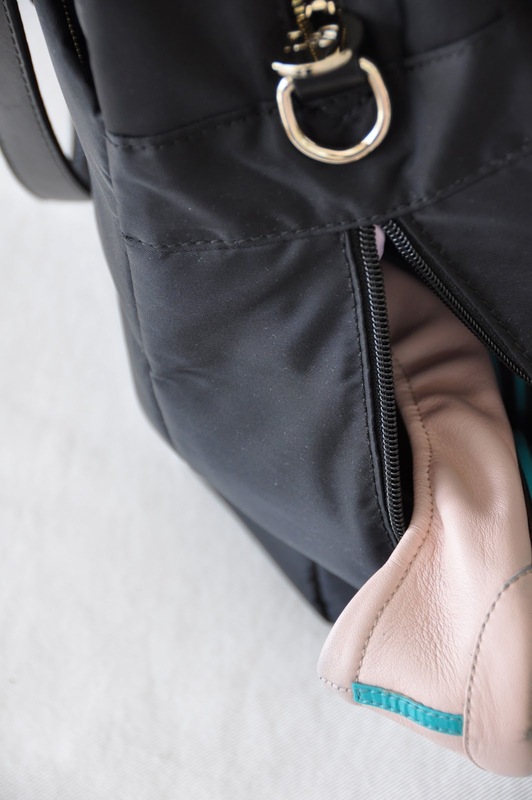 What's the one item that has a guaranteed spot in your carry on bag? 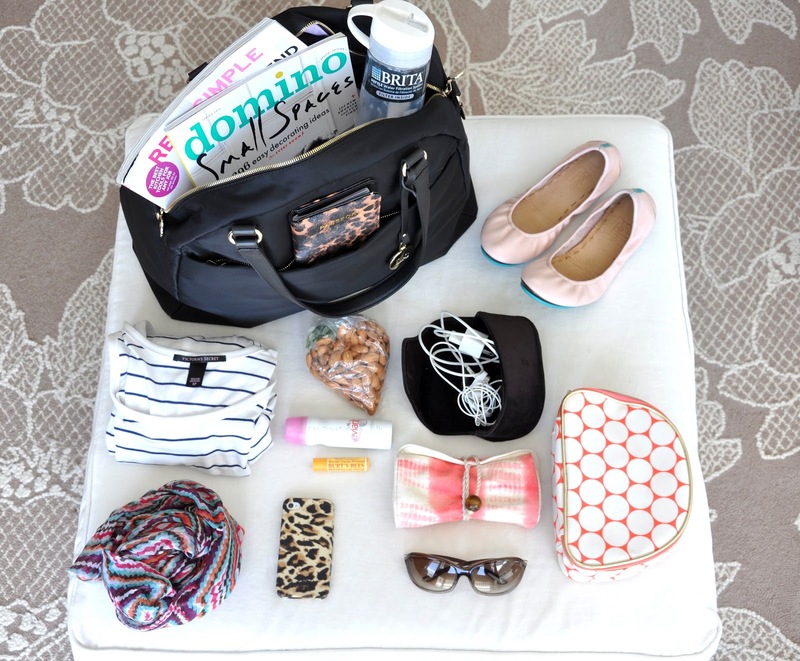 This bag is so cute, and I love all of your essentials -- great post! 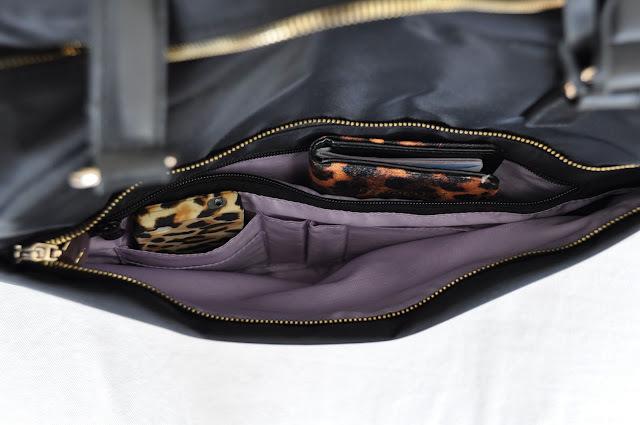 Could my handbag ever be this organized...love! Ha, my dad always makes fun of me for bringing so much stuff in my carry-on, but we'll see who's laughing if the airline ever loses our stuff... You are so organized! Love! What type of shoes are those? I have several pairs of Tieks and they are so great and comfy. I love the quality of the leather too. this bag looks beyond fantastic! 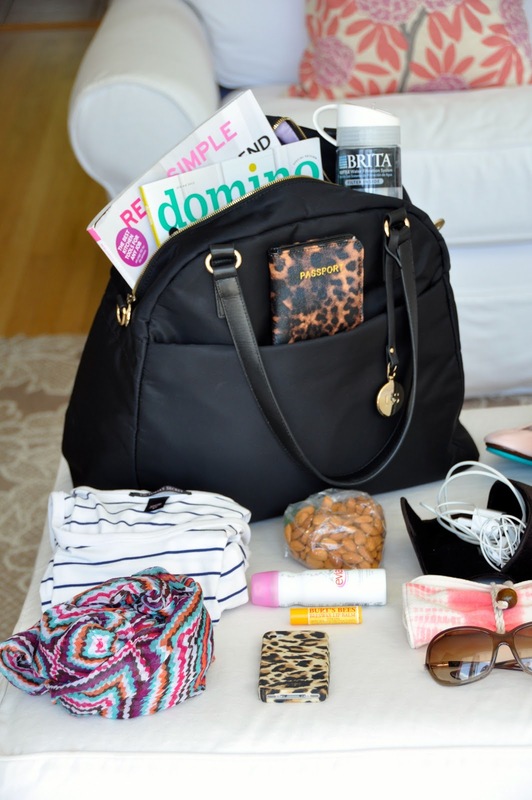 I'm a freak about keeping things organized and I hate how messy everything gets while traveling! I may have to order one of these! 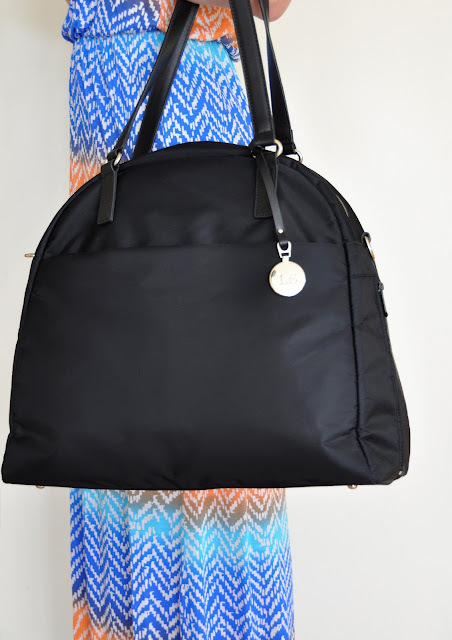 This bag is great. I use it every time we travel. I hate the stress of flying and this just makes my life easier. I have my tablet with me everywhere and it fits fine in there. Where did you get the dress that you are wearing in the first picture (blue/orange)? I love those colors! I just bought this bag after reading your posts on the O.G. and the O.M.G. I can't wait to get it and start filling it up!! Where did you get the dress in the top picture? BP at Nordstrom last year. Where is the phone case from?? Where did you get your passport cover from?